2017 New England Book Festival Runner-Up, Young Adult Category! Viktor Castle also has a secret. He's tasked with protecting humanity yet cursed by an ancient evil to destroy it. After Viktor saves Ana's life, her abilities grow stronger. Drawn together, she senses Viktor has answers to lifelong questions. Only he shuns her at every turn, knowing he has saved her only to put her in more danger. As Ana struggles with her attraction to Viktor, he tries everything to bury his unexpected feelings for her. But they must find a middle ground. For only together can they combat the dark forces threatening both their lives . . . and their souls. MARKED BEAUTY was a fabulous read. 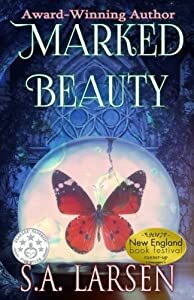 It's a YA contemporary fantasy with tons of exciting and dangerous otherworldly happenings, romance, and a large cast of varied and interesting characters. Ana, the main character, can feel the emotions of others through their life energy auras. This gift is not only powerful, but it's overwhelmingly difficult for her to live with. Her situation becomes even more difficult after the mysterious Viktor saves her life. As they are drawn together romantically, powerful forces threaten to destroy not only their relationship, but the lives of their friends and the world as they know it.